Grand Marais, MN: Scratch another one off the bucket list. 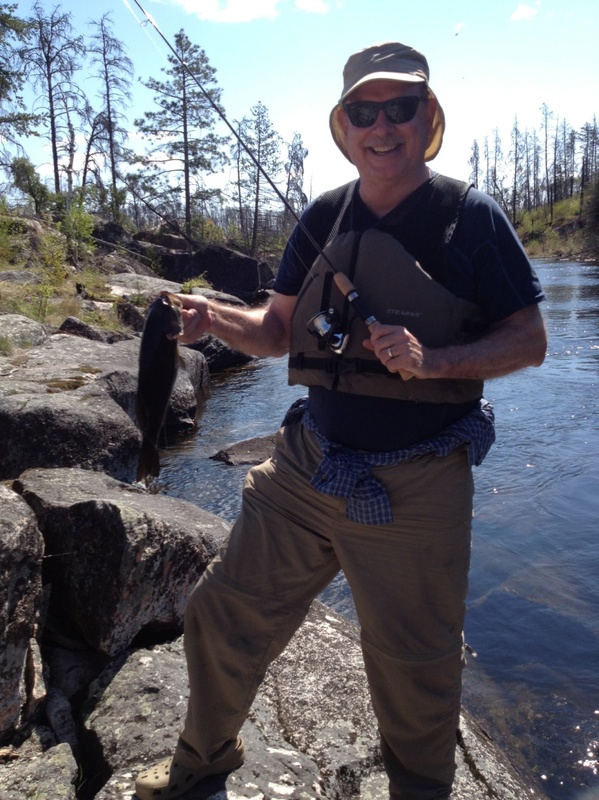 After a six hour drive north from the Minneapolis airport, my baby brother Fred (56 years old) and I arrived at Tuscarora Lodge & Canoe Outfitters on the edge of the Quetico-Superior Wilderness. We would spend the next three and a half days paddling and portaging a canoe and four bags of gear and food through the Boundary Waters Canoe Area wilderness. Sue Ahrendt is a warm, sincere, blonde who appears to be from Scandanavian stock. With her husband Andy and their two teenagers, she owns and runs Tuscarora Lodge and Canoe Outfitters. During the canoe season she’s a canoe trip planner, organizer and facilitator. Before settling in for the night, she lead Fred and me through a full orientation about the gear we would take with us, the rules and regulations of the Boundary Waters wilderness area, and the map of our route. She made helpful notations that pointed out landmarks and tips on how to locate portages on the topographic map of our route. In a million acres of wilderness, a good, well-marked map is a nice thing to have. We spent the night in a bunk house sorting and loading the clothes and rain gear we would add to the supplies provided by the lodge. This would be our last night sleeping on mattresses for a while. I didn’t realize how much I’d miss that. The weather forecast for the four days we would be out was good—sunny days in the low seventies and temperatures dropping into the forties at night. Forecasts and the actual weather are often at odds. As Sue dropped us, our canoe and gear off at a launch site on Gunflint Lake, low cumulus clouds scudded in and the wind picked up. It looked as though it would rain at any second. Before she left us, Sue said that if we wished to reconsider, we could paddle to the nearby Gunflint Lodge and call her. We could stay at Tuscarora and canoe in her lake. She also showed us on the map another site several miles into the trip were we could cut back to a pay phone at a Forest Service site if we wanted to bail out. She didn’t know how driven the Buckleys are. We were no farther than 100 yards from our put-in spot when we heard the memorable, mournful wail of a loon. The balsam firs and granite outcroppings on the shore and the loon’s call verified we really were in the ‘North Woods.’ After paddling about a half mile down Gunflint Lake, we found the cut that would take us into Magnetic Lake and the Granite River system that we would traverse for the next three days. Our route turned north and directly into the chill wind that would buffet us for most of the day. Our checkpoint before crossing the boundary into the official wilderness area was a copy of a Swiss chalet that a monied romantic had built on an island at the head of Magnetic Lake. As we cut behind the island to get a respite from the headwinds, we came upon a solo loon. He let us glide within 15 feet and then put on a show as he arched his back, lifted his head and breast out of the water, and spread his wings in a mating display. He was one of only two unaccompanied loons we saw on the trip. I hope he found a mate. As we left the lake, we were in the confines of the river. The United States was to our left. Canada was on the right hand shore. Though it flowed north in our travel direction, the current wasn’t enough to overcome the unrelenting wind. A short paddle brought us to our first portage. For those who haven’t canoed, a portage is an overland route that bypasses un-navigable rapids or waterfalls. Portages can range in length from 20 or 30 yards to nearly a mile. All gear is unloaded at the portage and is packed to the other end of a trail, where it will be loaded into the canoe that also has to be carried there. We had our first minor calamity at the take out for our first portage. I wore wading sandals for canoeing and to climb into and out of the water. I packed a pair of hiking shoes to wear on the rocky portage paths. A heel strap broke on a sandal as I was unloading the canoe. Driving up from the airport, Fred and I both learned that neither of us had packed duct tape. No self-respecting American male should go anywhere without duct tape and WD-40. Here we were without either or even a sewing kit to fix the sandals. Suffice it to say that I wore heavy, cold, wet, hiking shoes for the remainder of the trip. We had four packs, a canoe and two paddles to tote. 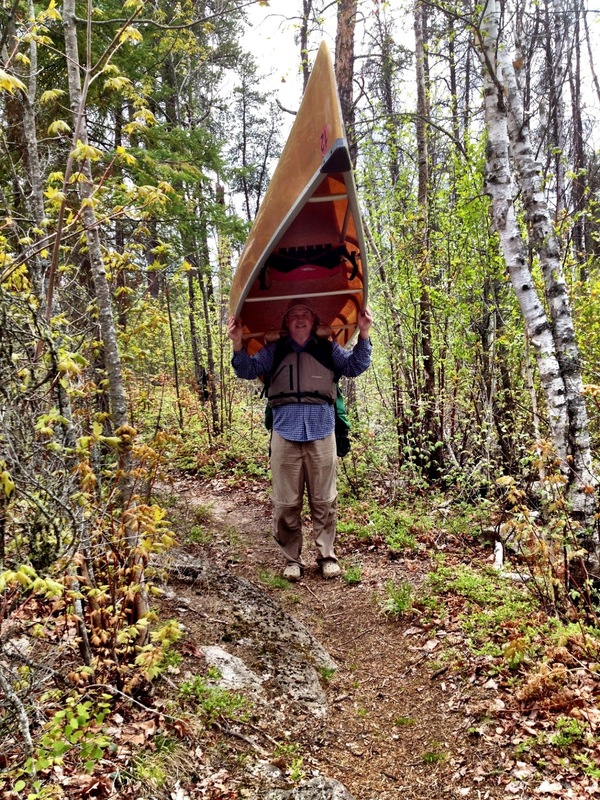 I lifted the canoe over my head and settled it on the neck yoke to head down the trail. It’s not easy to maneuver a 17’ canoe balanced on your shoulders as you meander across a rocky trail. After watching me struggle, Fred, who is younger and stronger, carried the canoe on the rest of our portages—ten in all. We barely got the boat into the water when we had to pull out for another portage. This was a short carry downhill around Little Rock Falls, one of two waterfalls we’d encounter on the Granite River. As we were taking out for this portage, three canoes came into view. There were two men in each as well as one Jack Russell terrier. They apparently had run the rapids we had bypassed. 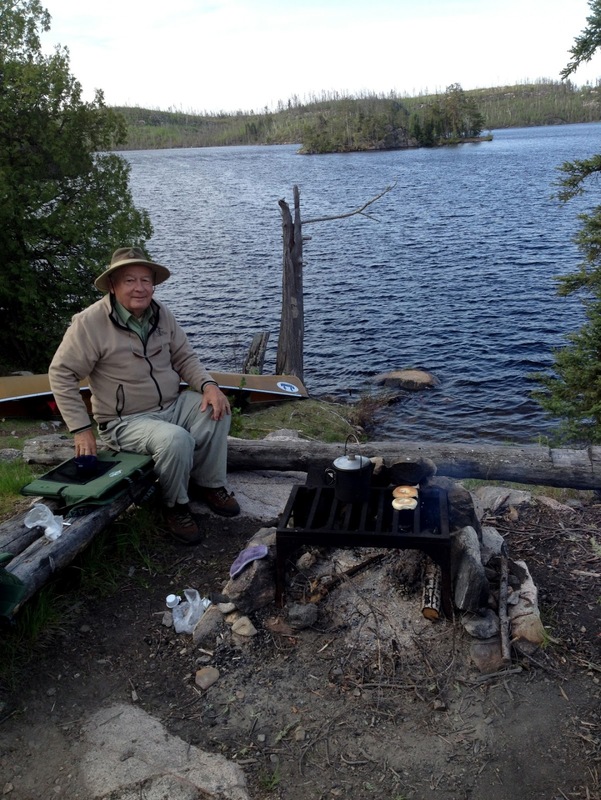 They had been on the canoe trail for four days and were headed to Saganaga Lake. They were friendly and gave us some helpful advice. We never saw them again. Nor did we see another person for the next two and a half days. When we set back out into the river, we had about a mile to paddle before the next carry at Wood Horse Portage. 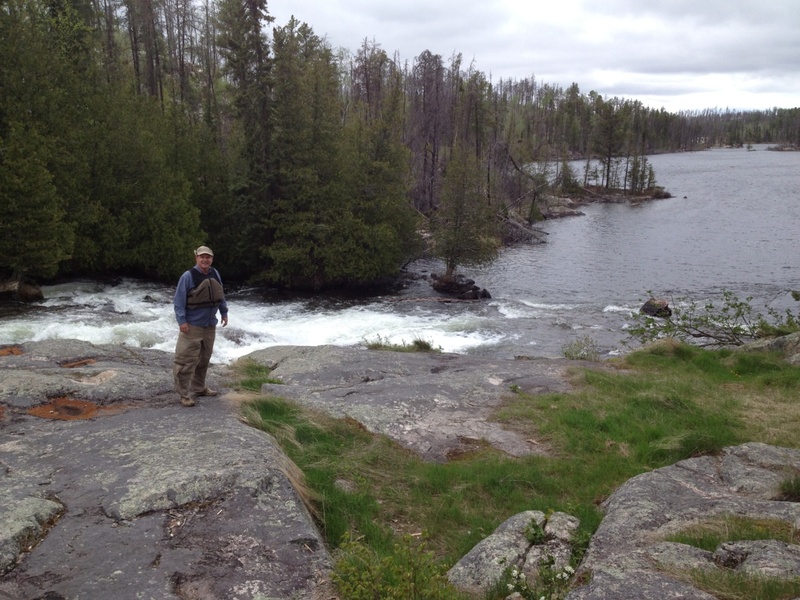 This portage dates back to the Indians and the Voyageurs, French trappers who used this water highway in the 1700s to get their furs to market at the Hudson’s Bay Company. Our landmark for this portage was a “big white rock with a monument.” We found this a tad amusing since this forest is filled with big white rocks. The monument turned out to be a small stone cairn about 18 inches high. Nonetheless we found our mark and made our third portage of the morning. We took a break for lunch—bean burritos on soft tacos, good hearty carbohydrates to fuel us for the next leg of this trip. Alas, not only did I not bring duct tape and WD-40, I didn’t bring Tums. What was I thinking? It was another relatively short paddle to the longest (but not the most difficult) portage of the trip. We crossed back to the American side of the river to undertake a 100 rod (1/3 mile) portage into Clove Lake. All of our portages involved two trips at a minimum. When Fred was able to get a pack on his back and the canoe over his head, I would take another pack. Then we would hike back and pick up the other two packs. I had it fairly easy. All I had to do was hike. Fred had to lug. We carried up and over two small hills and dropped down to the shore of Clove Lake. Mid-May is early spring in the north woods. Delicate blueberry blossoms speckled the forest floor. There was a profusion of wildflowers along the portage trails—trout lilies, bloodroot, and wild strawberries complemented the blooming serviceberry bushes. The opening aspen leaves weren’t much larger than thumb tips, and the sweet scene of Canadian balsam slipped by on the breeze. Sue Ahrendt had told us that fishing was good at outflows of rapids or entering rivers. We had our hearts set on fresh Walleye Pike for dinner one night of the trip. Unfortunately, we were skunked here as we had been at the base of Little Rock Falls. 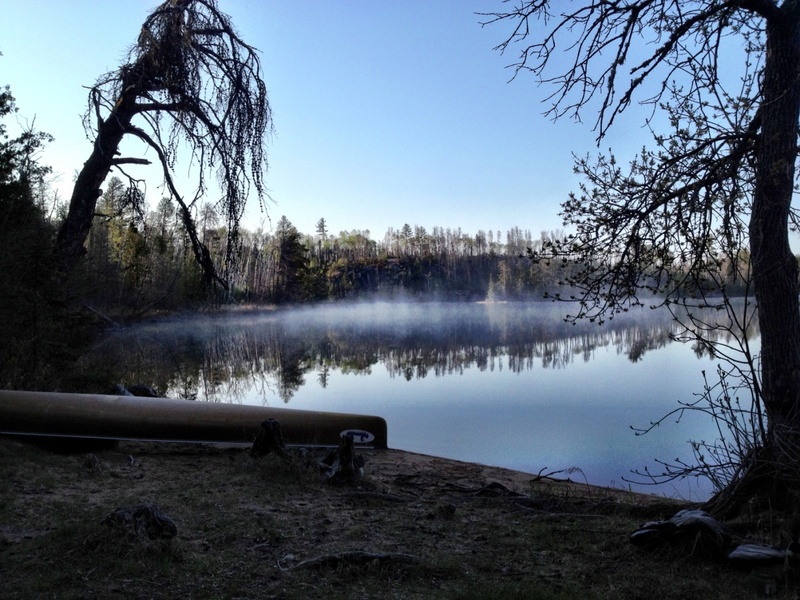 Sue had suggested a camp site at the back of a secluded cove on Clove Lake. It was just right. The site sat on level ground with a good fire grate and logs to sit on near the fire. Our first attempt at pitching the tent looked like something out of the Three Stooges until I uncovered the instructions in the tent bag. We found that it went up very easily when we knew what we were doing. We hit our second minor calamity that night when we found that the propane camp stove we had wasn’t working properly. Rather than a nice, round, even flame at its base, there was a jet of fire coming out the side. Fred dubbed it the “dragon stove.” That meant that all of our cooking would have to be over wood fires. That night we had fresh steaks which had been packed frozen that morning, but from then on, all food was dehydrated and had to be prepared with boiling water. It is much easier to boil water over a concentrated propane burner than it is over an open fire. The wind died, the sun broke through, and we were treated to a beautiful evening. There were no phones, no cell service, no internet connections. Other than the occasional call of a loon, we had complete quiet. It was no wonder that Fred chose to sleep outside that night. Not only was there no ambient noise, there was no ambient light which made stargazing remarkable. What a difference a day makes. I emerged from the tent to discover a solid coating of frost on the ground and gear. Fred was curled up in his sleeping bag, his toboggan cap pulled down tight over his head. Mist rose from a lake as smooth as polished crystal. Although it had been colder than 40 degrees the previous night, today’s weather would match the forecaster’s promise. The sky was clear. The sun was high. We had a light, following breeze, which was just enough to keep the mosquitoes and black flies at bay. Later, we would learn to loathe a south wind. If the previous day had been accented by wildflowers, this was a day for the birds. As we slipped our canoe away from the camp site, a Ruffed Grouse drummed on a blown down log. We watched a Bald Eagle soar and circle before us. Hooded Mergansers and their mates dove for fish, and Goldeneye ducks and Mallards paddled near shore. Minnesota’s north woods are home to gray wolves, moose, bobcats, bears, and Canadian lynx. Though we saw evidence of moose and lynx, we never saw any of the animals. We did hear wolves howling at night. In fact, the only mammals we saw were beavers, red squirrels, chipmunks and a Snowshoe rabbit clad in his brown, summer coat. As we headed out for our second day on the river, Fred suggested that he paddle and I fish. Our first fish was a small Northern pike that came out from under a sunken tree to strike my lure. It was small and not something we wanted to eat. I was able to shake it off the hook at the side of the canoe to avoid bringing the toothy fish into the boat. There was another fishy looking place at the end of this portage. I told Fred it was his turn and paddled the canoe to the seam of fast water at the outflow of the rapids. The lure barely hit the water on his first cast and the ultralight spinning rod bent nearly double. After five minutes of pulling on each end of the line, a fat, feisty smallmouth bass came to hand. 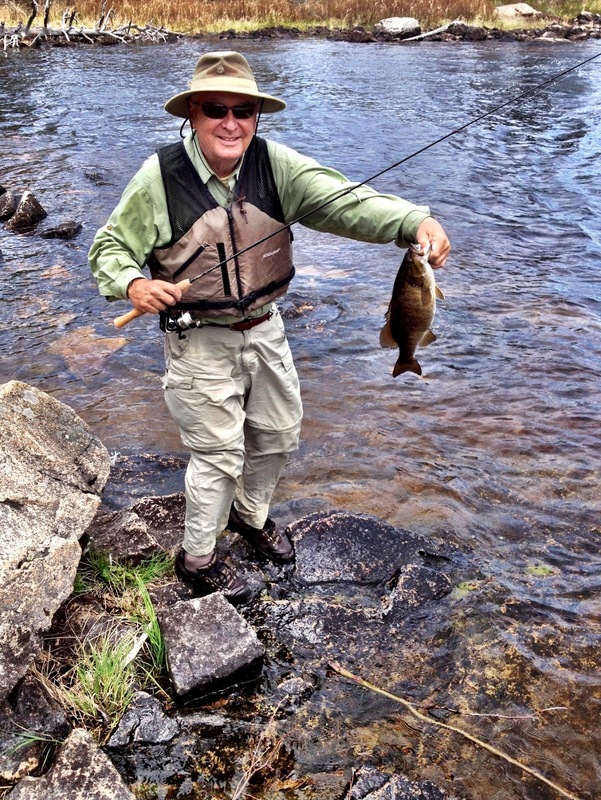 The fish weighed more than three pounds—a nice smallmouth anywhere. But, we were still holding out for a dinner of walleyes, and the bass went back into the water. Our next leg took us past Granite Lake on the Canadian side of the river and into a cove for the worst portage of the trip. “Swamp Portage” is only 400 yards long, but it offers some tough areas to negotiate. A man-made catwalk traverses the start of the swamp but ends abruptly in muck. Blowdowns crowd the trail. After the wet stretch, there is an uphill climb over loose rock followed by a steep descent to the put in site. By the time we had carried all our gear through, we decided on lunch. I noted that it was nearly two o’clock and figured we would get a later start on setting up our camp that evening. We were still several miles and one more portage from the site we hoped to use. It was a short paddle to our next stop. Fortunately, the Gneiss Lake Portage is short and easy to negotiate. There was another likely looking fishing spot at the put in point, and we each landed a bass. We paddled through an area called the “Devil’s Elbow,” which can be tricky in low water during the summer. We ran a short, mild rapids and emerged into Maraboeuf Lake, where we’d set up camp on a beautiful point overlooking islands in the lake. The grassy site had several ample piles of moose droppings but no sign of Bullwinkle. At dusk we sat by the fire and watched a pair of beavers swim back and forth across the lake. As high cirrus clouds began to darken the sky, we knew there would be no stargazing that night. We had no rain at night but woke to a wind coming from the south. Since most of our day would be spent paddling north, we thought that was a good thing. We’d enjoy a following wind to aid our paddling. That and the fact that we had only two short portages to make lead us to believe that it would be an easy day. As it turned out, this would be the wettest, longest day of our trip. The trip down the long Maraboeuf Lake was uneventful. Forest fires had burned the land on both sides of the lake. Scorched spruce stumps seemed to pierce the sky. We’d paddle past islands 200 yards from shore that had been burned in the maelstrom of a major forest fire. It was evidence that man made fire breaks can be marginally effective at best. The portage at Horsetail Rapids, which looked to be short and easy, was the most deceptive we encountered. Although it was less than 100 yards long, the path was narrow, crooked and crossed sloping bedrock. Towards the end of the route, Fred had to get into a side channel and wade with the canoe. A blown down tree partially blocked the way, and he tried to duck to get the canoe under the tree. That’s when his feet went out from under him and he toppled onto his back. The pack on his back saved him from what could have been a serious injury. During the fall, one of his Crocs came off, and I raced downstream to get it. We took a break to gather our composure and rest before traveling to our final portage of the trip and our entry into Saganaga Lake. It was a short paddle to Saganaga Falls and the easiest portage of the trip. After we got our canoe and gear over the portage and on to the lake side, I took the opportunity to fish while Fred stripped down out of his wet clothes and spread them to dry. The scattered showers that came and went all morning had let up. 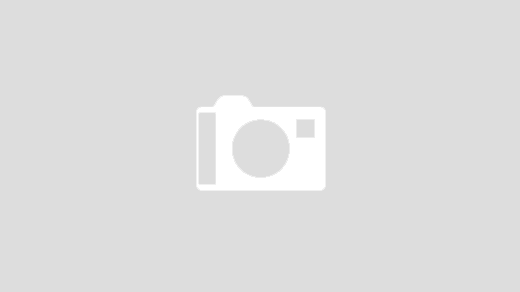 The sun and the wind would dry the synthetic cloth quickly. My first cast with a white, plastic jig was struck by a fat, female, smallmouth bass. She was thick across the back and gravid with eggs ready to spawn. I caught and released two more in quick succession and turned the rod over to Fred who did the same. We decided to head into the lake to look for a place to have our lunch. We wanted to get a leg up on the next day to shorten our paddle out of the wilderness. As we headed into the open water, the winds increased and sped our traverse to Conners Island, where we found a sheltered cove with a camp site where we could stop and eat. If Fred’s fall at Horsetail Rapids was calamity number three, we were about to suffer a robust number four. We had to head west from the cove and then turn south towards our final destination. Our goal was to get to the eastern shore and paddle the shoreline south to avoid the big, open water of the lake. As we left the cove and headed east, heavy gusts of wind pushed white caps up in front of us. We tried to angle into the waves, but in one critical moment, we were broadside to the wind. Just like that, the canoe was swamped and we were rolled out into the cold waters of the lake. I remember shouting, “Stay with the canoe,” as I came up for air. Then, “Grab your paddle.” Fred was already kicking towards the shore 150 yards away. My next thought was hypothermia. I knew we wouldn’t drown. We had life jackets on and were with the floating canoe. But, we were dressed for 70 degree weather, not 50 degree water. We kicked safely to shore, warmed by adrenalin. Three of the packs had drifted to shore with us and the canoe. A fourth had floated to a nearby cove and was hung up on a downed tree. The fishing rod was gone, but we had our paddles. Luckily, our map, which was sealed in a zip-loc bag, stayed in the canoe. Unfortunately, we had come ashore on the island and not on the eastern shore that had been our destination. After we gathered everything and re-secured it in the canoe, we attempted to dry out. Like falling off a horse, we knew we had to get back on, and we launched the canoe to head back across the wind. This time, we took a much more diagonal course that kept us quartering into the wind. The wind wasn’t letting up at all. Rather, it turned from gusts to a steady blow. When we finally got around the corner into what is called the Saganaga Corridor, we were paddling dead into the wind. We were tired, wet and still shaken from our dump into the lake. It seemed we barely made any progress. The waves rocked the boat. Headed into them, we weren’t likely to capsize. We still had a mile to go to a suitable camp site on Camper’s Island. I can’t recall ever being so glad to see a camp site. It was at the point of the island and whipped by the wind, but it was dry. It was so dry in fact that we decided not to build a fire to cook. The south wind was warm, and we had both worked up a sweat paddling against the wind. When we pitched the tent, we had to secure the ground tarp with boulders to keep it from blowing away, and we had to stake the tent with every peg available. After a cold supper, Fred offered a prayer, thanking God for our safety, for our many blessings and for the land around us. At dusk, the wind died, the air chilled, and we slid exhausted into our sleeping bags. Our plan was to get up at daybreak, eat a cold breakfast and break camp as soon as we could in an effort to beat the wind that we expected to come up at mid-morning. Recall the quote about “the best laid plans.” At 4:00 AM I was awakened by tent canvas slapping into my face and the sound of waves breaking on the shore below the camp site. I couldn’t believe it. I didn’t expect wind until mid-morning or daybreak at the earliest. I dreaded getting out of the sleeping bag and what I imagined lay ahead for the day. We still had three miles to go, directly into the wind and with half of that journey bordered by the open lake. When we arose to reality, we found that the wind sounded worse than it was and the waves weren’t as high as we feared. We broke camp by seven that morning and reached the boat landing where someone from Tuscarora Lodge would come and pick us up. Fred and I agreed that we came back from this bucket list adventure a little lighter, a little wiser, and a little more appreciative. As we turned onto the road, I could hear Fred humming “He’s not heavy, he’s my brother.